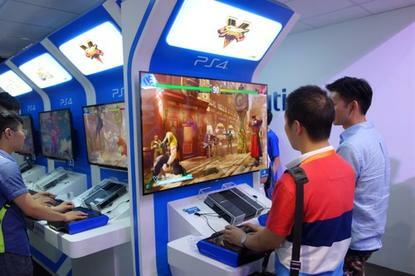 Chinese gamers play Street Fighter V at the Sony PlayStation booth at ChinaJoy. These are exciting times to be a gamer in China, according to 19-year-old Dai Qi, a soon-to-be college student. The country has recently lifted its ban on video game consoles, and gamers like Dai are trying to decide between buying an Xbox One or a PlayStation 4. "Now we don't have to go outside the country to buy gaming systems," he said on Thursday. Dai was among the thousands of visitors who came to ChinaJoy, an annual gaming convention in Shanghai. And if the crowds were any indication, China's interest in video game consoles is high. At the show, Microsoft and Sony attracted throngs of gamers, including high school and college students. Long lines formed around the two exhibition booths as visitors played games such as Halo: The Master Chief Collection and Street Fighter V while dance music boomed in the background. It's the first edition of the ChinaJoy show at which foreign video game consoles have been legally available. Although China effectively ended its ban on gaming systems in September 2013, it was a year before Microsoft began selling its Xbox One there, and Sony's PlayStation 4 only entered the Chinese market in March. With the lifting of the ban, Microsoft and Sony have a huge opportunity to tap one of the world's largest markets -- but analysts have been questioning whether Chinese consumers will buy the consoles. Research firm Niko Partners predicts that initial demand will be lackluster, with official sales of both systems expected to reach fewer than 550,000 units this year in China. Part of the problem is the existing competition: PC and smartphone games have had ample time to take off as they were not subject to the ban. It's created a market where many Chinese consumers are used to playing free gaming titles at an Internet cafe or on their phone. Another problem is price: The PlayStation 4 and Xbox One cost more in China than in the U.S., although the prices are starting to fall. At the ChinaJoy show, Sony gave a limited time discount and was selling its PlayStation 4 for 2499 yuan (US$410). However, that's still higher than the $399 price in the U.S. The Xbox is priced even higher, causing Chinese gamers to complain initially. 17-year-old Xu Jiashen planned on buying an Xbox One, at 2999 yuan. He was impressed with the system, and said that Chinese online games still can't quite compare with console gaming. "I think a lot of people will buy these systems," he added. "Online gaming is more about companies grabbing market share. Console gaming is designed for actual gamers." However, another challenge facing the consoles is whether China's regulators will allow more violent gaming titles to enter the market. Earlier this month, the Ministry of Culture further lifted restrictions around gaming consoles, and even endorsed their development. But still in place are restrictions that bar games from promoting violence, gambling or drug use. The Halo series is a first-person shooter, but the battles revolve around futuristic soldiers fighting aliens, and contain less blood than other games. During the ChinaJoy show, Microsoft advertised other upcoming titles such as Rise of the Tomb Raider, Gears of War, and Halo 5: Guardians, but it remains to be seen if Chinese regulators will actually approve them for sale. For some Chinese gamers, the regulations hardly matter. Before the government lifted its video game ban, 15-year-old Tan Ceyuan was already buying consoles from the country's gray-market dealers, who have long specialized in secretly importing consoles from Hong Kong or Japan into China and providing pirated games. Tan said he bought a Hong Kong version of the PlayStation 4 a year before Sony launched the official mainland China version. He was at the ChinaJoy show, and pessimistic that the country would approve any of the most violent, but best-selling, console games. "I don't think the government will change the restriction," he said. Grand Theft Auto V is one of his favorite games, and he buys titles from online sellers. However, other Chinese are more optimistic that the restrictions will loosen. Furthermore, they believe that consoles will eventually take off in the country. 21-year-old Pang Ranming doesn't plan on purchasing a console, claiming that he's grown too old for them. But he still sees the allure, and expects many consumers to buy them. "I think a lot of Chinese people want to try something new," he added.